1-1-502. State flag. There is hereby established a state flag of Montana. 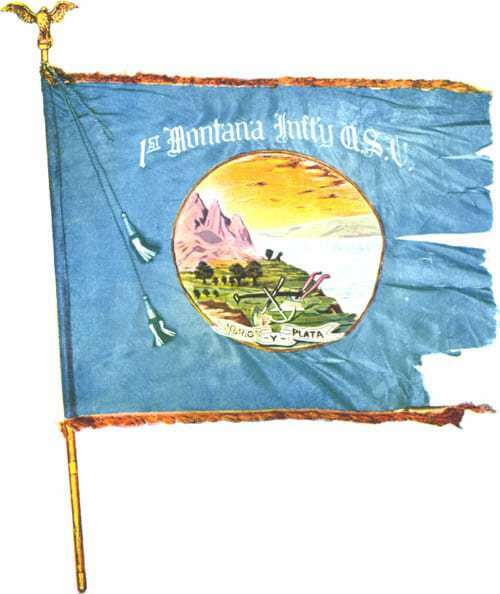 The state flag of Montana shall be a flag having a blue field with a representation of the great seal of the state in the center and with golden fringe along the upper and lower borders of the flag; the same being the flag borne by the 1st Montana Infantry, U.S.V., in the Spanish-American War, with the exception of the device, “1st Montana Infantry, U.S.V.”; and above the great seal of the state shall be the word “MONTANA” in helvetica bold letters of gold color equal in height to one-tenth of the total vertical measurement of the blue field. 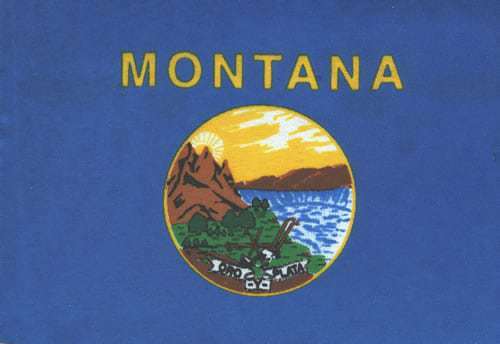 The official flag of the State of Montana contains a reproduction of the Great Seal of the State in color on a field of deep blue, with gold fringe along the upper and lower borders. Although the flag was carried in the Philippines by the Montana Volunteers in the Spanish-American War in 1898 and was for many years considered the state flag, official action did not come from Montana legislators until the session of 1904. The original hand-made banner carried by the First Montana Volunteers in the Spanish-American War is preserved by the Historical Society of Montana. It is 60 X 44 inches overall; the dark blue silk of the field is tattered and somewhat faded. However the Great Seal, beautifully hand-embroidered into a heavy tapestry, is in perfect condition. The words “First Montana Infantry, U.S.V.” are embroidered in white over the multi-colored Great Seal. A 3-inch gold fringe adorns the top and bottom of this historic banner.